Most food reviews have an angle, something to ‘hang’ the piece on. It’s something that stands out, good or bad, a little something to make the piece. Manjal offered so many angles I don’t know where to start, so I’ll list them all… It’s a new Indian restaurant (and a good one); the menu is different and exciting (although bizarrely the two I saw were not identical); the decor is contemporary and bright (and some of the tables enjoy views across the water of Millwall Docks and the twinkling lights of canary Wharf); the service is friendly (although a bit scatty); and the food is tasty and fresh (although it was delivered a bit too fast for my liking). So let’s dive straight into the last point. There’s an ideal time for food to be served. Somewhat unfairly on restaurants this varies from person to person but the basic rules generally apply: there should be a ‘suitable’ time from taking the order to delivering the starters so diners can enjoy a drink and a chat, then there should be a ‘suitable’ time from clearing the starters to bringing the mains so diners can have another drink, but also so they feel the food is cooked freshly and not pre-prepared (let’s ignore the fact that few places can cook every order from scratch without some sort of prep, but that’s besides the point for diners). In this country restaurants can safely err on the side of quicker service rather than slower because we don’t linger around a dinner table like, say, many Southern Europeans. But then they don’t like curry as much as us so what do they know anyway. But no-one likes to get food delivered so quickly he feels like he has suddenly become part of a restaurant race. So when the starters arrive before the ordered popadoms have even reached the table and the mains appear before the beer has barely washed down the last mouthful of starter, then most of us will start dreaming of those lazy Southern European dinners. But the food was undoubtedly fresh. The Mili Juli Subzi (£4.95) has perfectly cooked vegetables that really did remind me of those picked from my grandfather’s garden. And, joy, upon joy, the meat in the Chicken Karahi (£7.95) was running with tasty juices. Not a dry lump in the house. The starters – just two of a very interesting lineup – were also excellent. 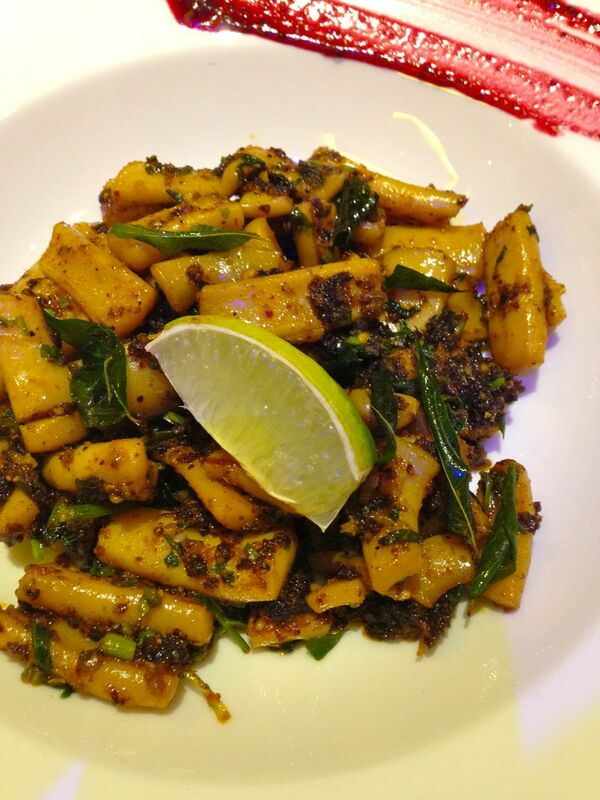 Kanaval Pirattal (£4.95) is squid, South Indian style, and the thick, dark sauce will please even the most ardent chilli head. Hot indeed. 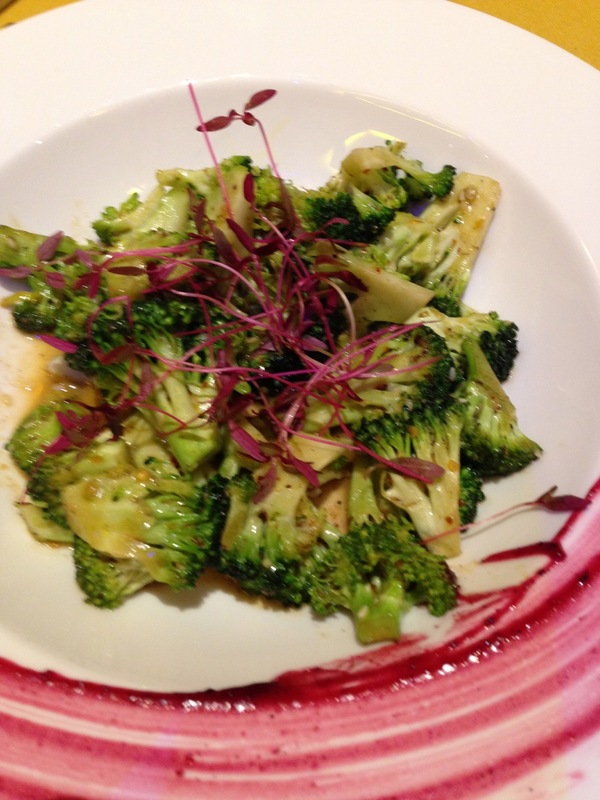 Even the Broccoli Varuval (£3.95), simple enough, but also very fresh, had a kick.